"The difference is very significant," said Yi Zhang, who led the study conducted by the Medical Technology & Practice Patterns Institute, a Bethesda nonprofit. "It's not five or seven percent. It's pretty dramatic." The study also found that patients had a 13 percent lower mortality risk if they were treated at nonprofit clinics, regardless of chain ownership, than if they received care at for-profit clinics. The study's findings are likely to stir debate because U.S. mortality rates for dialysis remain among the highest in the industrialized world -- one in five patients dies each year -- and because more patients than ever are getting their care from for-profit chains. 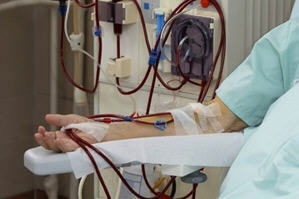 More than 80 percent of American dialysis clinics are run for profit. Chain ownership has increased more than 11-fold since the early 1990s. Two for-profit companies -- Fresenius Medical Care North America and DaVita Inc. -- now control about two-thirds of the market for dialysis care. In a recent ProPublica investigation, some doctors, patients and advocates voiced concern that industry consolidation has winnowed down care options, thus reducing competition, and questioned whether providers' efforts to make money had affected quality. Today's study does not identify chains by name, but Fresenius and DaVita ranked first and second in number of clinics in 2004, the start of the study period. Since then, they have acquired the two chains that were next in size. The largest nonprofit chain is Nashville-based Dialysis Clinic Inc.
A Fresenius spokeswoman said the company would not comment on the study's findings until it had a chance to examine them fully. DaVita officials said the study reflected an outdated version of reality. "This study examines seven-year-old data, and significant changes in the way dialysis care is delivered have been made in the more than half a decade since, with continued overall improvement in patient outcomes," the company said in a written statement. More recent information from the federally funded U.S. Renal Data System (USDRS) shows that large dialysis providers achieve better mortality outcomes than nonchain or hospital-based facilities, the DaVita statement added. The MTPPI study excluded patients treated in hospital centers -- a key difference with some previous studies -- because they tend to treat patients with more complicating conditions, government data show. In comparing chains to each other, however, the study's results largely mirror those in reports by the USRDS showing that Dialysis Clinic Inc. has lower mortality and hospitalization rates than other large dialysis providers. The study tracked about 34,900 Medicare patients who started dialysis in 2004 at 3,601 free-standing clinics, following them for two years. Medicare pays for most dialysis under an entitlement created in 1972. Researchers compared outcomes at the five largest dialysis chains -- four for-profits and one nonprofit -- and at nonchain clinics. They adjusted data for differences in patient mix, as well as for facility size, staffing, geographic disparities and income inequality. In addition to lower mortality risk, the study found that patients at the nonprofit chain had the shortest hospital stays and were most likely to be in the recommended range for anemia, despite being given the lowest doses of anemia-treatment drugs. Its clinics also were staffed differently, with more nurses relative to patient-care technicians, who are unlicensed and, typically, lower paid. Update: DCI did not comment on specific findings but released a statement from founder and board Chairman Dr. H. Keith Johnson saying the chain's "non-profit status allows us to devote a larger proportion of our resources to improving the care we offer to our patients."